conjugated to KLH, corresponding to amino acids 1-29 of Rat BMP6. Positive staining can be observed in embryonic and adult central nervous system. Rat radial glial cells of the developing central nervous system from E11 to E19. In rat peripheral nerves a selective intracellular immunoreactivity can be found in perinuclear region of most Schwann cells which form the myelin sheath. However, some Schwann cells were negative for the antigen. Pre-incubation of anti BMP6 with amino-terminal peptide 1-29 of BMP6 inhibits binding of the mAb to tissue sections. Pre-incubation with other amino-terminal synthetic peptides of human BMP7, BMP4, BMP3 and BMP2 as well as an irrelevant peptide does not inhibit specific tissue staining. Shipped at 4°C. Upon delivery aliquot. Avoid freeze / thaw cycle. Stable for 12 months at -20°C. Our Abpromise guarantee covers the use of ab15640 in the following tested applications. IHC-P Use a concentration of 1 - 2 µg/ml. Perform heat mediated antigen retrieval via the pressure cooker method before commencing with IHC staining protocol. WB 1/100. Detects a band of approximately 57 kDa (predicted molecular weight: 57 kDa). Induces cartilage and bone formation. Belongs to the TGF-beta family. 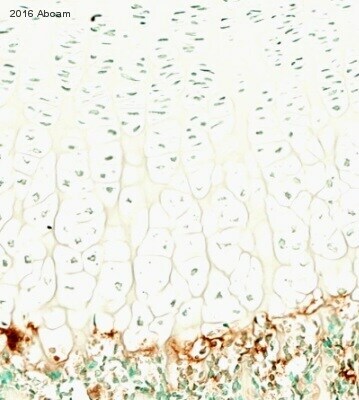 ab15640 staining human U2-OS cells by ICC/IF. Cells were PFA fixed and permeabilized in Triton-X-100 prior to blocking in 2% serum for 1 hour at 20°C. The primary antibody was diluted 1/100 and incubated with the sample for 1 hour at 37°C. 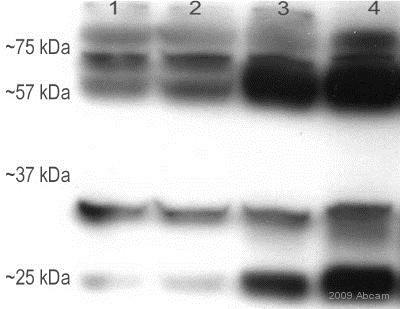 The secondary antibody was Alexa Fluor®488 conjugated chicken anti-mouse, diluted 1/1000. ICC/IF image of ab15640 staining primary myoblast cells. The cells were 4% PFA fixed (10 min) and then incubated in 1%BSA / 5% normal donkey serum / 0.3M glycine in 0.1% PBS-Tritonx100 for 1h to permeabilise the cells and block non-specific protein-protein interactions. The cells were then incubated with the antibody (ab15640, 1µg/ml) overnight at +4°C. 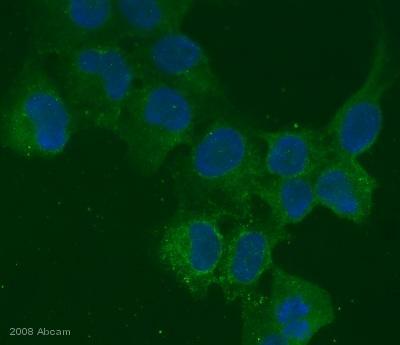 The secondary antibody (green) was Alexa Fluor® 488donkey anti-mouse IgG (H+L) used at a 1/1000 dilution for 1h. Publishing research using ab15640? Please let us know so that we can cite the reference in this datasheet.